Want to get a good night’s sleep without a prescription? 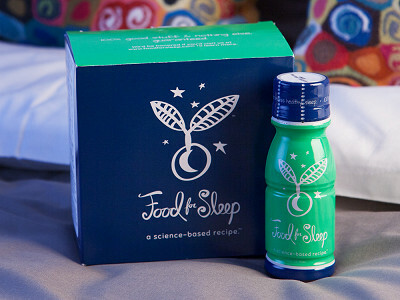 Try Food for Sleep, a bedtime drink filled with natural, food-based ingredients that promote sleep the same way healthy bodies do. Founder Bob Jones has spent 20+ years creating solutions for health problems with medical nutrition instead of drugs. 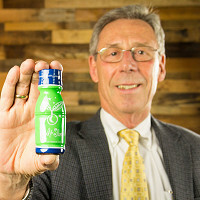 He created his natural sleep aid with a tryptophan-rich whey protein and tart cherry juice, both rich in melatonin and other sleep-inducing nutrients. The specific blend induces consistent, sound sleep through the night. Bob left out any added sugar or other additives, so the drink is really, really tart. But if you drink it fast (or even chilled), it’s a small price to pay for quality rest. And without any drugs or herbs, Food for Sleep won’t leave you feeling groggy the next morning. Even if you’re usually a sound sleeper, Food for Sleep can be your secret weapon the night before a big exam or important meeting. Or take it along traveling to sleep soundly in any hotel or time zone. Whenever you need to rest up, simply drink up. Hi everyone! I'm Bob, the founder of Food for Sleep. Our all natural recipe is based on real science that duplicates what a normal, healthy body does for healthy sleep, and we do it using only food ingredients. I'd be happy to answer any questions you have. Does this apply to us "older" women....??? @Deborah Oh my, yes! Most of the typical "sedatives" quadruple the risk of falls in older people. Food for Sleep is much safer, works well, and won't leave you feeling thick-headed the next morning. @Deborah Oh Deborah, that's hardly old at all (compared to me...). We've had a number of women of a certain age tell us that it helps them sleep, and they like that they're not consuming any additional chemicals. Let us know if it helps you. @Deborah I kind of laughed out loud when I read Bob's response and your clarification. I had figured you meant what you meant. Let's see how Bob updates his thoughts now that he realizes your focus. Oops, Bob beat me to the punch. Thanks Bob. @Jules I'll follow up and let you know! Is this safe for diabetics and/or people with Kidney disease? @Lisa It's just foods. Drinking a bottle of Food for Sleep is in some ways like drinking a glass of tart cherry juice and eating a bowl of yogurt. But if you have any concerns, check with your health care professional. @Bob This doesn't really answer the question about diabetics...how much sugar is in a bottle? @terri sorry hit the wrong key. Susan is asking a good question and I would add why did you use stevia in the drink? I was prepared to purchase til I saw the stevia added. @Susan There's 5 grams of sugar - all of it from the tart cherry juice. Each bottle also contains 5 grams of protein, 0 grams of fat and a total of 50 calories. We leave dietary decisions to our customers and their medical professionals, but the medical professionals that we've talked with say that it should be easy to incorporate this into the daily routine of a person with diabetes. In fact, there's considerable evidence showing a correlation between short sleep and poor glucose control. It's conceivable, therefore, that better sleep would actually improve glucose control. But again, we leave those decisions to the individuals and their health care professionals. @Bob @Terri - Thanks for your question about stevia. The food science answer is that stevia is a part of the flavor system that we used to reduce the natural astringency of the whey protein (which delivers the tryptophan). Said differently, we wanted to make it taste a little better without adding any additional calories. @Bob Thank you! Perhaps these nutritional facts should be added to the product listing? Hello, as one of the interested "older' consumers on the search for a healthy sleeping aid, I have two questions:1). Is it gluten free? and 2). Some research I have read stated that it is not recommended to use Melatonin on a consistent basis (better for jet lag or temporary sleep issues) is there any recommendation or as for how long one can use your product? thanks. @Duchess 1)The recipe is completely gluten free. But we can't assert that the product is gluten-free, because it could have come into contact with trace levels of gluten during manufacturing. If there is any gluten in Food for Sleep, it's at microscopic levels. 2) Your research is correct, but Food for Sleep is not a melatonin supplement: it's a combination of a tart cherry juice (clinically demonstrated to promote healthy sleep) and a whey protein that's rich in bio-available tryptophan. 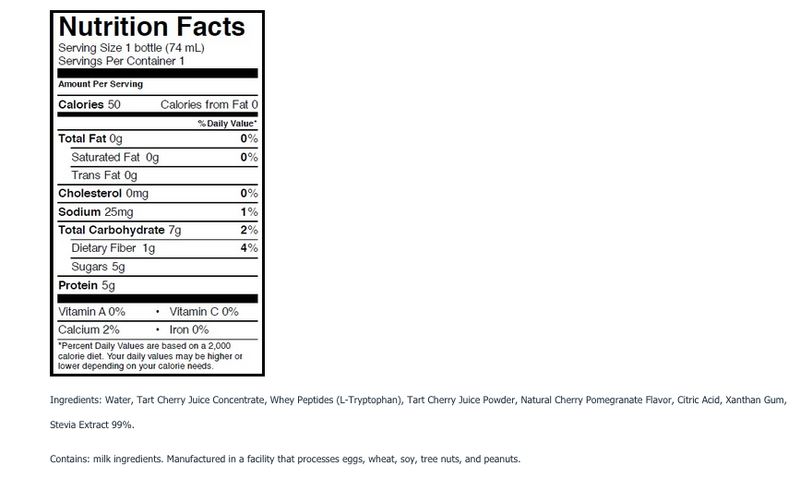 The tart cherry juice is much more complex than simple melatonin and though the mechanism of action is not fully understood, what is clear from the clinical research is that it works and it's safe. Although you may not need Food for Sleep every day, all of the studies say that its ingredients are safe for consumption every day. I do not have a problem going to sleep or staying asleep; however, I always feel exhausted when I wake up. Do you think this would help my issue? @LAuren If you're sleeping on a treadmill, probably not... [Kidding] All kidding aside, there's a small chance that you have a sleep disorder. Here's a link you might pursue: http://healthysleep.med.harvard.edu/healthy/getting/treatment/sleep-disorders-screening-survey. We talk to a lot of our customers, and many of them tell us that they felt like the quality of their sleep was significantly improved. One woman told us that she had vivid dreams of George Clooney (but it would be irresponsible of us to promise that). I suspect that you will sleep more soundly than you usually do. Please let us know. What is the normal dosage? A bottle a night? And how long for the effects to start on average? Want to know how much to order. @Jennie Hi Jennie! Most people find that a half-hour after drinking one full bottle, they are gently lulled off to sleep. It's not like hitting yourself in the head with a hammer - you can stay awake and function if you need to, but you'll be yawning and ready to turn out the lights within a half-hour or so. Kidding. I'd start with two six-packs to establish good sleep habits, and then re-order as needed. What a shame you couldn't have bothered to go organic! @Emily Oh Emily - I asked five experts about "organic" and got seven answers. Rather than delay our market launch, we satisfied ourselves that our ingredients work naturally and went to market. The "organic" designation may be in our future, though. Hi @Bob, Does it help you stay asleep longer or help you sleep through the night? @Cecilia Hi Cecilia. Here’s where we tell you that everyone’s different (and your actual mileage may vary…). Our goal is to help people sleep better by simulating their natural processes. Most people tell us that they sleep more hours than they’d been sleeping. Those who complain about waking up during the night tell us that they still wake up, but it’s no big deal – they roll over and go back to sleep. Since this is just foods, not a drug, its impact is less than if it were a pharmaceutical product – but Food for Sleep seems to help a lot of people. Please provide complete list of ingredients. I see that most if the posts have been by women. I am concerned more with the man in my bed! He has issues with staying asleep all night and /or getting a restful nights sleep. I too have some issues with falling asleep as my body says it is tired but the brain says NO you have thoughts to think yet. I take chelated magnesium at night and that helps. Will this product interfere with the magnesium?? @Char Most of us have that same experience: you go to bed or wake up for some reason and instead of going (back) to sleep, you start thinking about work or the family budget or whatever. Food for Sleep isn't a miracle cure for that, but most of us find that it helps enormously in lulling us off (or back) to sleep. There is some clinical evidence supporting chelated magnesium for sleep. There is no evidence that suggests that there would be any interference with the ingredients in Food for Sleep. And in fact, several noted medical websites encourage taking both chelated magnesium and whey protein. Perhaps you should consider buying a six-pack for you and another for that man you're talking about (sorry - couldn't resist). Your product sounds great but of course, I have some questions. First of all, does it need to be refrigerated (or is that just for taste), secondly, do you ship to Canada? thirdly, there's a lot of plastic waste generated from the containers and at $4/bottle it isn't exactly cheap to use on a regular basis. Are you going to be making a more economical powder form or have it available in larger containers any time soon? Hi Cathy, thanks for your interest and great questions. I'll leave the technical product questions to Bob, but in terms of shipping to Canada I can be of assistance. The Grommet does not ship outside of the U.S. directly. However, there is an alternative method for receiving Grommets outside of the U.S through Bongo. All of the information can be found on our shipping FAQs page here: https://www.thegrommet.com/customer-service/faq-shipping. @Mike Thanks, Mike - you're the right guy to answer the Canada question. Cathy, the refrigeration is strictly optional - some people like the taste better if it's chilled, others prefer room temperature. Like you, we were concerned about the waste. We managed to find a bottle that would stand up to heat during bottling and which was still recyclable, which helps at least a little bit. We don't know of any way to get an effective amount of these ingredients into a powder form - so we could make it, but it wouldn't work. However, if our customers ask for it, we will be happy to create a 30-pack that we could sell for a lower cost/bottle. @Bob Thanks for the information both Bob and Mike. Bob, have you thought about putting it into larger containers,or would it spoil once opened? In your experience, what is the average number of servings/bottles it takes to help get someone sleeping through the night again? @Cathy You're welcome! When we were interviewing people during product development, many of them asked for bottles that were 3 oz. or less so that they could take the bottles in their luggage without violating TSA regulations. That had a lot to do with us picking the 2.5 oz. bottle that we're now using. Still, we may think about larger containers down the road. A lot of people tell us that they've experienced a noticeable improvement in their sleep with their first bottle. But everyone's different, and if your stress levels are extraordinarily high or if your troubled sleep habits are really deeply ingrained, it make take longer. One fellow who's troubled by back pain told me that he's now sleeping 5-6 hours a night. Before I could sympathize, he went on to say how pleased he was, because previously, he'd never slept more than 3-4 hours per night. We're glad if we can help you bring about an improvement. $24 for a 6 pack equals $4 a night. Can this be used nightly? Habit forming? $120 a month seems quite high. @James It can definitely be used nightly, but not many of our current customers use it that often. Many find that after they re-tune their sleep habits, they use Food for Sleep 2-3 times per week. It's less habit-forming than that cup of coffee that I have every morning. (Again, it's just foods: there's no evidence that cherry juice and whey protein are habit-forming at all.) And several people have pointed out that a latte often costs $4 and then they made the obvious observation that they'd happily substitute one expense for the other if it helped them feel good and sleep well. Can guys below 18 use this? Want to get a good night’s sleep without a prescription? 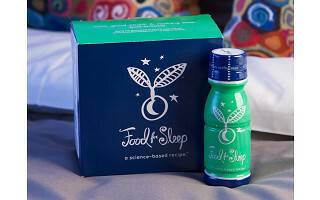 Try Food for Sleep, a bedtime drink filled with natural, food-based ingredients that promote sleep the same way healthy bodies do. Founder Bob Jones has spent 20+ years creating solutions for health problems with medical nutrition instead of drugs. He created his natural sleep aid with a tryptophan-rich whey protein and tart cherry juice, both rich in melatonin and other sleep-inducing nutrients. The specific blend induces consistent, sound sleep through the night. Bob left out any added sugar or other additives, so the drink is really, really tart. But if you drink it fast (or even chilled), it’s a small price to pay for quality rest. And without any drugs or herbs, Food for Sleep won’t leave you feeling groggy the next morning.